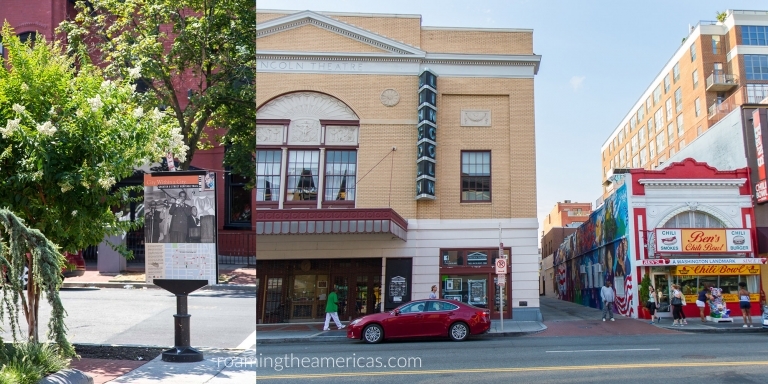 If you want to explore multicultural history in Washington, D.C. and need a break from the museums and National Mall, here’s why I think you should check out this free walking tour of the U Street neighborhood. Explore U Street: Free walking tour in Washington, D.C.
“Who else has walked these streets?” I wondered as I walked. “Who called this neighborhood home? What were their lives like?” I love the sense of place I get from imagining what something once was. When you learn about the people whose lives and experiences filled up the physical spaces that you’re seeing, the inanimate comes alive. Community is something you can’t measure, but it flows across the sidewalks, seeps into the bricks, and sits on the park benches. And they become living, breathing things—full of stories to tell. It’s why I think learning the history of a place is so powerful. Home to poets, musicians, authors, professors, doctors, and historians, U Street was a place where African American families—some of whom could trace their roots to the free blacks who lived in Washington, D.C. before the Civil War—built a vibrant, flourishing community in the early 20th Century. 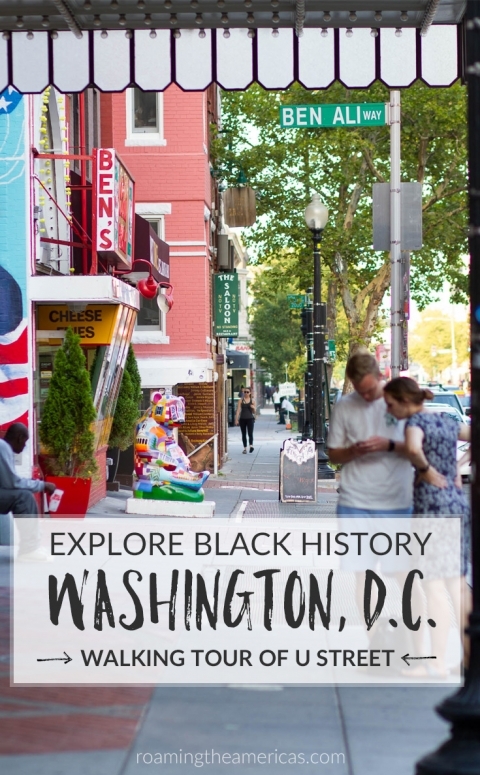 Until 1920, Washington, D.C. had the largest urban African American population, and U Street was heart and soul the black community in the city. Because segregation was so strict, it meant that people of all means lived together in one community because they had been pushed away from mainstream society, and their own expressions of culture started to emerge. 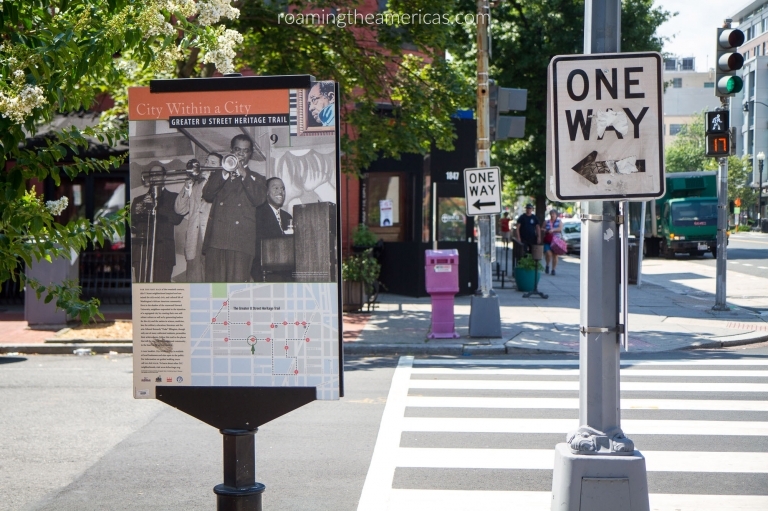 Some say that U Street was even the birthplace of the Harlem Renaissance, the golden era of artistic and cultural expression in African American communities that took place from the 1910s through the 1930s. The walking audio tour explores the Greater U Street Heritage Trail, which is part of the African American Heritage Trail in Washington, D.C., in 2 loops: the East Loop and the West Loop. On the West Loop, you’ll visit the famous club where jazz legends like Count Basie and Duke Ellington played, stop by the oldest black Catholic church in Washington (and hear clips of their incredible gospel choir), and learn about the contrast between old and new U Street as you stand outside Busboys and Poets, named in honor of the great poet Langston Hughes. You’ll learn about the pain expressed in the wake of Dr. Martin Luther King, Jr.’s assassination through riots that spiraled the neighborhood into decay, and what has happened in the years since. On the East Loop, you’ll visit the iconic Ben’s Chili Bowl (they’ve even got a vegetarian chili), the African American Civil War Memorial that honors the 200,000 black servicemen who fought for the Union in the Civil War, and the old YMCA building, which served as a home away from home for hundreds of African American men who moved to the area. The U Street Corridor is located north of downtown Washington, D.C. and south of the Columbia Heights neighborhood. U Street itself runs from east to west (as do all the streets with letter names in D.C.), and the center of the U Street neighborhood is where U Street crosses 14th Street. The neighborhood itself encompasses many surrounding blocks to the north and south of U Street. The U Street Metro Station is located conveniently right across the street from Ben’s Chili Bowl and the Lincoln Theater. If you’re going to or from the National Mall area or other D.C. neighborhoods, this is where you want to go to catch the metro. I’m not an expert on the Washington, D.C. metro system (thankfully I had Mikkel with me as a guide! ), but making sure you’re going to the right place is as simple as asking. The metro website also has a great Rider Guide with helpful information for newbies and visitors. 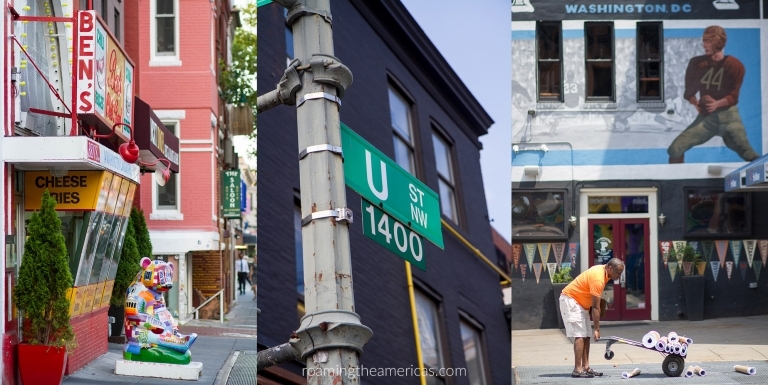 Want more information about U Street?